Thanks to the Hometown Weekly, another pet will soon be reunited with his family! 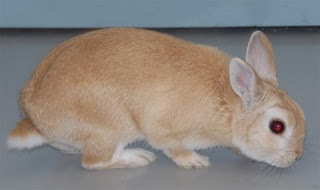 It turns out that Toby the dwarf bunny's real name is Popcorn and his family feared he had been eaten after he hopped off one day. Fortunately a kind pet-loving person spotted him and knew he wasn't safe outside and brought him to the shelter where he has been for the last 12 days. His family saw him featured as our "Pet of the Week" in yesterday's paper and called to claim him. We had already taken him to the vet to be neutered today, so he will be reunited with his family tomorrow once he has had a chance to recover from his surgery. I certainly hope you encouraged them to make him an indoor-only bunny rabbit! Have you ever seen cuter faces than these?